Two Wheel Oklahoma has been nominated for a 2013 Newsie Award for Best Local TV Show. Wow! 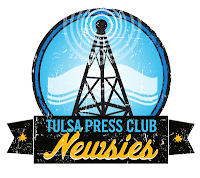 Newsies are an annual awards gala sponsored by the Tulsa Press Club. Members nominate local media outlets and personalities for outstanding print, radio and television journalism. Wow again! We were flattered- especially considering we couldn't even spell journalism before receiving this award. Brad and I want to encourage all of our fans (and all of their cousins, friends and parole officers) to vote for Two Wheel Oklahoma! Seriously, we're honored to be recognized by the Tulsa Press Club and listed alongside such illustrious local media. Whether we win or not, it's nice to be noticed. Now go vote! A link to the voting site would be helpful.